How are We Counting? Safety Resources 30-Skill Challenge Coaching Handbook Make a Gift that COUNTS! One Million Safer Kids … begins with ONE. After almost three decades of providing safety education through Kidpower, we’ve seen again and again how a few simple skills can stop most attempts of bullying, abuse, kidnapping, and other violence. Help share our Safety Resources to that parents, teachers, and other caring adults can gain practical knowledge about bullying prevention, abuse prevention, and stranger awareness. 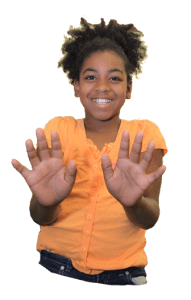 Kidpower’s Positive Practice Method and exceptional curriculum prepare young people to develop confidence, create healthy relationships, and protect themselves from most bullying, abuse, abduction, and other violence. Join our Count Me In community for easy updates on what to do and how to do it to make kids safer and success stories about what others are doing. Since 1989, Kidpower has brought skills to prevent most bullying, abuse, abduction, and other violence to more than 5 million people. Kidpower’s One Million Safer Kids Campaign, launched July 1, 2011, will do exactly what it says: more than two million kids are safer as a result of what we do together, and we hope you will join us to help a million more! To begin, start with one…. The One Million Safer Kids Campaign is happening one-by-one in classrooms, parks, playgrounds, and living rooms every day in communities around the world as Kidpower staff, board members, and volunteers as well as parents, educators, and community leaders take simple steps to create access to age-appropriate safety skills and information. No one is in a better position than you are to make the kids in your home, neighborhood, or community part of One Million Safer Kids. Read these testimonials to see how people have used Kidpower in their lives to make a difference. A world with One Million Safer Kids is also a better world for all of us, not just the million we help directly. It’s a world with more joyful playgrounds, classrooms, and neighborhoods. It’s a world with safer interactions between children and strangers in parks, farmers markets, and other public places. It’s a world with more relationships strengthened by strong boundary setting skills. It’s a world with less trauma and injury. It’s a world with one million young people using and strengthening advocacy skills to help themselves and others — skills they can develop and use for decades to come not just in school but in relationships, in work, in play, in politics, and in parenting others. The potential ripple effect of One Million Safer Kids is both staggering and achievable. What Can YOU Do to Help Create a World with another One Million Safer Kids? Teach a child a safety skill. Our Skill-A-Day Challenge makes this easy to do for 30 days, so start with #1 and you’ll already be making a difference! Learn more, then show others what you learned. 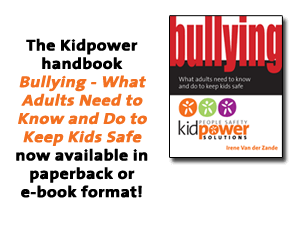 Subscribe to the Kidpower e-newsletter, read an article or one of our books, or take a personal safety workshop for yourself. Arrange a workshop for parents, families, or teens. Contact a Kidpower center near you or email us and we’ll put you in touch with the center closest to you. Speak up at your service club. Rotarians, Lions, and other service club members are among the most skilled folks we’ve met when it comes to spreading information and creating opportunities. Talk with them about what’s possible. Give a donation that will go to work right away to help kids be safer. Our resources put almost three decades of Kidpower’s personal safety expertise at your fingertips. You can use them now to make kids safer. As leaders in bullying, violence, and abuse prevention education since 1989, we’ve learned what works. Our focus is always on building safety and confidence, not fear. As a nonprofit, we’re committed to putting what we know in your hands through resources designed to be practical, informative, and accessible. Our FREE online Library with hundreds of articles, videos, and blog entries is a great place to start! Our affordable publications provide you with comprehensive, accessible tools for keeping kids safe, full of clear examples, inspiring stories, and practical steps to follow. Our cartoon-illustrated Safety Comics are a fun way to introduce and reinforce “People Safety” knowledge with younger and older children. The Kidpower Book for Caring Adults: Personal Safety, Self-Protection, Confidence, and Advocacy for Young People is available now as paperback and an ebook. With a foreword by Gavin de Becker, this comprehensive guide is for parents and other adults who care about protecting children and teens from bullying, child abuse, abduction, and other violence. This new book gives an in-depth description of how to use The Kidpower Method to empower young people to develop healthy relationships, increase their confidence, and take charge of their emotional and physical safety. Use these resources for your family – and please share them with your school and youth organization. Stay connected through our FREE Kidpower News and Resources newsletter, Blog, Facebook, and Twitter to make safety a daily priority in your busy life. Read these Testimonials to see how others are using Kidpower resources to make kids safer. Who are we counting as a “safer kid” with Kidpower? We are counting kids who are safer because their adults have gained greater knowledge Kidpower about how to protect them from violence – and how to empower them with age-appropriate skills for taking charge of their safety and well-being with people everywhere they go: at school, at home, downtown, online — everywhere. Here’s some of our Testimonials. Giving parents knowledge and skills for protecting their kids from bullying, abuse, abduction, and other violence. Providing educators, youth development leaders, mental health experts, law enforcement officials, and other professionals with skills and concepts they can integrate into their standard practices to help kids be safer. Publishing a free e-newsletter with safety information. Offering free resources for anyone to download and share. Offering practical handbooks, Teaching Kits, Safety Comics, and other publications for sale. Serving as an expert resource for media and other community groups. Teaching children directly through our Kidpower and Teenpower workshops at any of our centers. The ripple effect of these actions extends through families and communities over time. One book, article, or TV program might reach someone who shares what they’ve learned with a whole school or organization, even if we don’t hear about it. One child using one skill, such as effective boundary-setting, can make friendships, family relationships, and interactions at school and at work safer and stronger, now and for decades to come. ONE Million Safer Kids starts with ONE! Here are stories from people taking action to make young people safer with Kidpower since we launched our campaign July 1, 2011 – from every continent except Antarctica! Thank you for permission to print the Kidpower bullying articles for all of the parents and teachers in our school. Your very practical information greatly strengthened our school safety programs. Count me in for 468 safer kids! I distributed your Safety Tips in the service club newsletter for our state, reaching over 500 community leaders. The Kidpower Skill-A-Day activities make it easy to see how I can help my toddler and my five-year-old grow safe and strong. They’re going to need me to keep them safe for a long time, but just by using clear and consistent language — we say “Check First” and “Be Aware” a lot! — I’m helping them build skills to take care of their safety and well-being. I felt good when I saw my little one make a fence with his hands and say “Stop” calmly and clearly to another toddler trying to take his toy at the park. I taught him how to do that! My students and I practice and use our Kidpower skills in class, at recess, at home, and in our community on a daily basis. Kidpower skills also reinforce our school’s conflict resolution programs. Students and teachers together are building an atmosphere where kids feel safer from bullying. Our staff is enthusiastic about using the Kidpower’s Fullpower Teaching Kits to teach safety in our program for teens and young adults with cognitive disabilities. Our director is arranging weekly practice sessions for staff and students to practice the skills together. More importantly, the students themselves let us know they like the program, and we can see their skills growing! The Kidpower approach is giving me a practical way to help my two teenagers build skills to get around the city safely on their own. Because we’re actually reading the articles and practicing the skills, I see and hear what they can do. I worry less, and they show more confidence. I know this keeps them safer on the bus, the subway, and the sidewalk. 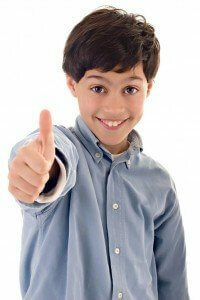 I was researching on the Internet last week for information on boundaries for Teens and found your web address. I was impressed by the format of the information as it was given in easily understandable principles. The impact sentences are simple and brilliant because they make the information accessible to teens. The other information I read was more global in perspective and used conceptual information that did not directly relate to experience. So the message was lost in the message, so to speak. Your message comes across loud and clear. Thank you for your great work! The fact that your information is so practical and immediately useable is makes it attractive. I am using your Safety Signs with teens and young adults with cognitive delays to help them practice how to stay safe with their friends and family, at school, and in their community. I made a presentation demonstrating Kidpower skills and sharing articles at a conference with 134 parents and educators responsible for the care of about 1200 young people. I used the concept of safety rules to make sure my kids and their friends are safe when playing on a trampoline. I also used my own boundary setting skills to speak up with neighbor who lets his large and scary dog play in the front yard without a leash. I also referenced the Kidpower Bullying book to have a talk with my children, other parents and a teacher about cyber bullying. After a man flashed a middle school girl walking past our elementary school, I used my Kidpower knowledge to talk with the principal and counselor about safety education language that was used on a TV announcement that went to the whole school, as well as wording that went out in a letter to all family members. I used your Bullying book to address issues in our Girl Scout Troop. I cannot enumerate the ways that I use and discuss Kidpower daily. Both in my work with children and families in a number of professional settings, and just as an active member of several communities, I am constantly incorporating Kidpower principles and techniques into daily life. I refer people to the website on a daily basis, whether it is just friend with children or who work with children, teachers I meet… anyone who has kids in their life, which really is most people. I regularly suggest Kidpower techniques to my kids to solve problems, who teach them to other kids. One Million Safer Kids starts with YOU! You can add to our count toward One Million Safer Kids with your donations! Give any amount to be used where needed most or choose from our Donation Drive options below to direct your gifts. All gifts are tax deductible in the US. For each $1 you give, we can increase our Safer Kids count by at least one more child! One curriculum book in the hands of a teacher costs only $20 and prepares her or him to teach 20 to 30 children a year. One new article costs $1,000 to create and distribute, and reaches over 1,000 adults who each learn how to make at least one child safer – and is available in our free online library for year to come. See our Donation Drive options for ways your contribution can have an impact. Direct your gift to send Kidpower Books to schools and libraries across the U.S. and around the world and increase our Safer Kids count! Let’s make sure EVERY school, youth-serving organization, and community library has resources to help people learn important skills to make their kids safer. Help us send Kidpower books to each and every school and library in the US and electronic versions to your choice of organizations worldwide and we will add even more kids to our Safer Kids count! We know that our materials in the hands of adults who work with kids help make many more kids safer than we are adding to our count, so if you choose the organization these books go to you can also Tell Us how many more kids it will benefit than our count below! Amounts below include shipping for printed books in the US. An international electronic book drive is below – or you can add to the gift to cover extra postage to ship a print book outside the US. $35 = 4 Kids. Send print copies of both of our new Kidpower Safety Comics books for younger (3-10) and older (9-14) kids to a school or library of your choice in the U.S.. with a note saying this is from you. We’ll also add 4 kids to our Safer Kids count or more if you tell us! $40 = 5 Kids. Send a print copy of our newest book, Bullying – What Adults Need to Know and Do to Keep Kids Safe, to a school or community library of our choice in the US. with a note saying this came from you. We’ll also add 5 kids to our Safer Kids count! For Young People, to a school, library or youth organization of our choice in the U.S., giving them the information they need to help young people build powerful skills to grow safe and strong. We’ll also add 7 kids to our Safer Kids count. $120 = 30 Kids. Send our cartoon-illustrated five-manual Teaching Kit to a classroom or youth group leader of your choice. These include step-by-step lesson plans and coaching guides to prepare adults to teach Kidpower safety skills to groups of children. $15 = 2 Kids. Send an electronic copy of our Kidpower Guide for Parents and Teachers in English or Spanish to a school, youth-serving organization, or library of your choice anywhere in the world, with a note that this is a gift from you. Direct your gift to provide scholarships for low-income kids and families to take a Kidpower Workshop. No one should be without the skills to be safer because of a lack of funds. Help Kidpower train our most at-risk kids and families. $30 Covers the cost of a child participating in one of our school classroom programs. $75 Funds e-mail consultation to help a parent, teacher, or other caring adult worried about the safety of their kids. We’ll add to the Safer Kids count based on the number of kids we are aware of who will benefit from each consultation. $125 Creates the opportunity for a low-income family to learn and practice Kidpower skills together. We’ll add to the Safer Kids count based on the number of kids we know will benefit from each family attending a workshop. $480 Funds the cost of 3 teens at risk because of disability or abuse participating in a Full-Force workshop with the head-to-toe padded instructor, which greatly increases their confidence. $900 funds a parent workshop or a parent-child workshop for a school or youth-serving organization in need. We’ll add to the Safety Kids count based on the numbers participating. $1,200 funds the cost of preparing a classroom teacher with a Kidpower in Action program including coaching and materials to incorporate “People Safety” skills into her or his classroom now and for years to come. We’ll add to the Safer Kids count based on the number of kids we know will benefit from the teacher training in the year that the teacher is trained. We will let the the teacher then report on additional Safer Kids as he or she shares the Kidpower as part of class curriculum. Direct your gift to fund the creation of a new article or publication that can reach thousands of parents, teachers, and other caring adults. Contribute to one of the following projects to make countless kids safer by adding important resources to the violence prevention and self-defense fields. For gifts of $500 or more, you can be credited for your donation in the article or book acknowledgements you are supporting if you choose! $500 funds the cost of a new article about safety that reaches thousands of people worldwide. We will add 500 kids to the Safer Kids when the article is published and another 5 kids (or more if someone tells us differently) each time the article is downloaded from our website or requested or used elsewhere. $2,000 funds the cost converting another publication to an electronic format, greatly increasing the accessibility of this content. Current projects needing support are our Safety Comics in English and Spanish, Comprehensive Training Manuals, and Teaching Kits. $20,000 funds the cost of developing and publishing a new book. Current projects needing support are: SafePower Self Defense – a cartoon-illustrated guide to teaching self-defense skills to people of different ages and abilities; Unlimited Adaptability – How to Teach People With Special Needs to Take Charge of Their Safety; and Teenpower – How to Take Charge of Your Safety and Your Freedom!